I absolutely love this FOLIO idea! This is such a fun project! In this class, you’ll learn how to transform a traditional manila file folder into a work of art and treasured keepsake in the theme of your choice. As with all my classes, you’ll receive a detailed instruction sheet that walks you through the entire process step by step. This idea originally came from Candy Coldwell (http://candycreates.blogspot.co.at/2013/04/tim-holtz-style-passport-pocket-folder.html), but I changed it up a bit and added my own twists. Each folio contains four inner pockets that hold various sized tags that slide in and out for easy viewing. My first Folio project was a FAMILY FOLIO featuring five generations of my relatives (my kids all the way up to my great-grandparents). Black-and-white photos throughout the project to contrast with the vintage brown colors of the folio and embellishments. Next, I made a TRIP FOLIO that commemorated a special sailing trip from summer 2013. Twenty-one tags tell the story and show the pictures from our adventure. The backside (not shown in this image) features maps and additional images. Done in blues and yellows, I love the summery, sea theme of this project. 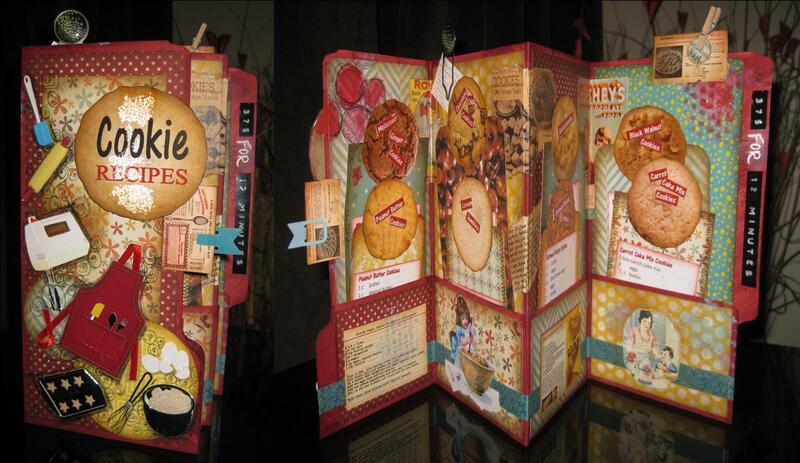 My third folio project was a COOKIE RECIPE booklet containing 8 of my favorite cookie recipes. Each recipe card is topped with a full-sized cookie image with an attached title. I included baking-themed embellishments to decorate the front, back, and inner areas, and used mixed-media techniques to add color and interest. 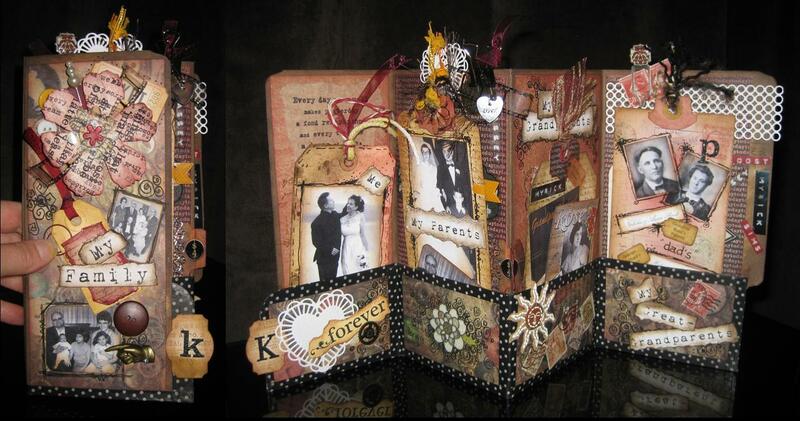 Fun to do in ANY theme, these mini booklets are fun to display on a shelf or give as a gift! Oh I love these! Great for gifts!